The naturally light and airy space is the latest in an ever expanding portfolio of North East interior designer supremo Julie Chambers, and like some of her other creations, it’s contemporary and stylish with some conversation-piece details. A nice place to be, and a pleasant place to sit back and have a drink, if nothing else – you can’t beat a good Chesterfield. 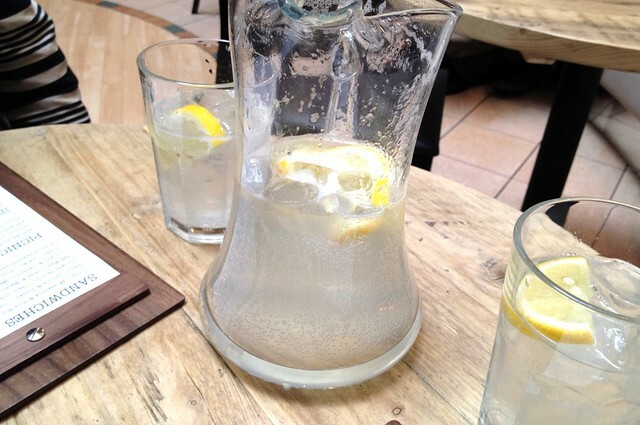 While browsing the menu, we are given a jug of ice water – always a nice touch that costs nothing, but any decent restaurant should do. Take note! We pass on wines and try something a little more homemade, as they are offering freshly squeezed lemonade for two, and with it being the single warm Saturday of the month, it sounds refreshing. Lately we have had many lacklustre “homemade” lemonades, but thankfully this doesn’t disappoint. Quite sour, actually cloudy, and ultimately what you want it to be – refreshing, and pretty good value at £3.95 (plenty for two). As tempting as it was, we tried Garden Kitchen’s signature dish, the “Garden Picnic” at the launch event – so pass this time, but will definitely return for it. A sort of take on afternoon tea (also available), £15.95 gets an assortment of sandwiches, pastries and salads for two to share, and comes on a cute miniature picnic table – definitely one for ladies who lunch! 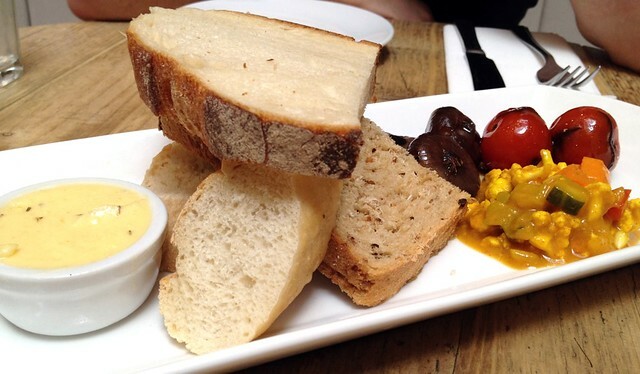 We settle on sharing some freshly baked breads with pickles and house butter (£3.95, pictured) to start. It come pretty quickly, and what the menu doesn’t state is that it comes with a piccalilli, confit tomatoes and pickled onions. Bonus! We might prefer crusty bread, it has to be appreciated that the bread is fresh and airy, and the accompanying garlic and herb butter is served oozy-soft. As with the water at the table – soft butter doesn’t take much effort but doesn’t go unnoticed when remembering somewhere as not just “OK”, but “great”. The bread is good, but the stars of the show are the accompaniments – the piccalilli is tangy and crunchy. the tomatoes yielding and sweet at first, then burst in your mouth with a really sour tang, and the pickled onions, sweet, almost appley – delicious and moreish. Can we get just these as a side? 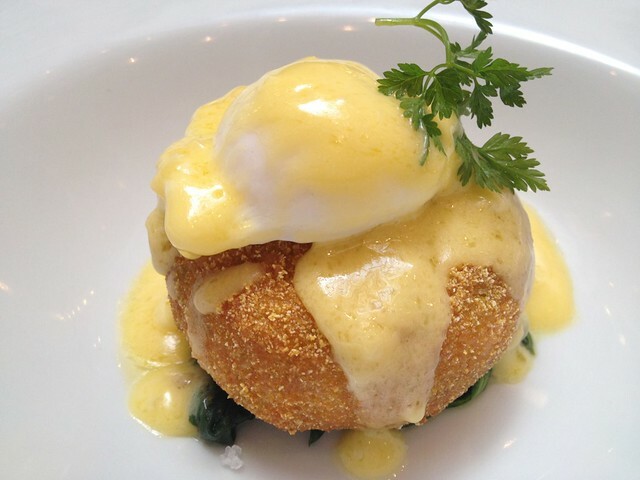 Pleasantly surprised with our first course, expectations are raised for the mains – I go for the fishcake on buttered spinach with poached egg and hollandaise sauce. Sounds like a winner on any menu, and when it arrives at the table it’s not disappointing. The fishcake is huge, and covered in a solid breadcrumb – not sure what the breadcrumb itself is but it’s great – crunchy. It sits atop a bed of spinach which provides the perfect contrast to the super rich and silky hollandaise sauce, and a nicely poached egg rounds off an impressive main. Have heard that the chips are pretty good – they would have went down well with this one. 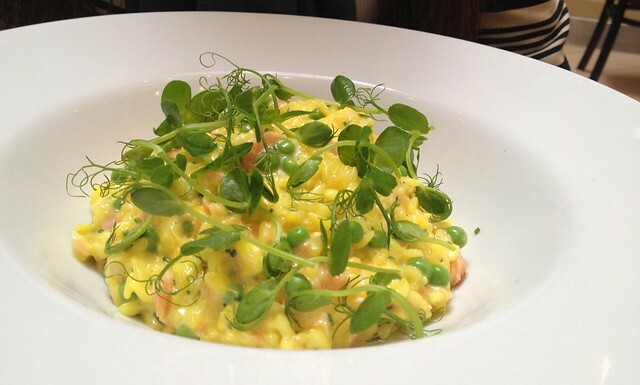 Ms. Newcastle Eats has pea and mascarpone risotto with smoked salmon and truffle. Sounds rich and tasty, and it is! The dish is chocka full of tasty smoked salmon, with just enough of a truffle flavour in the background to keep it interesting. Skilfully treading the line between being too loose and too thick – it hits the moreish spot, and is a massive portion. A side of buttered spinach provides some acidic contrast. Impressed. Service in general is quick, friendly, and fairly knowledgeable when pushed. Some of the staff admittedly haven’t tried all of the dishes, but this is only a month-old, and everyone is attentive but relaxed. We are offered but can’t manage a dessert or even coffee, but the idea of home-made muffins and tarts and does sound tempting. Interestingly, just down from the main restaurant at the entrance to Eldon Garden is soon to be a sister to Garden Kitchen, amusingly named “Garden Shed”. Offering sandwiches and coffee to take away – if the quality of this meal is anything to go by – they should have another hit on their hands. We can’t wait for it’s opening later this month – will have a go at some of the sandwiches and report back! Great to see an established name take ownership of the Eldon Garden area – and judging by how busy it’s been in it’s first month – already a success. Definitely worth a visit for a quick but quality bite in a laid back and stylish environment. Bill would have been ~£27, comped for review. Better than: Anything other restaurant/cafe in Eldon Square, particularly the chains. Worse than: Some top class restaurants offering set menus – perhaps a future addition?